Well, I felt that I didn't have enough expensive, time-consuming hobbies so on March 27, this little girl joined my family... Not to worry though, I know that I can't keep a horse on my boat! I should probably blame my friend, Sherry, for this. It's bad enough that she sold me both of my big boats. But then she had to run off and take over my Life's Dream! Sherry has given up her not-so-rewarding career in banking, and has decided to move to the country and open up a boarding stable. The beauty of this situation is that she knows very little about operating a boarding stable and, well, that was my major in college (don't ask me how I ended up in banking, I really don't know)! In any event, it seems to be working out nicely since I am willing to lend my knowledge (and physical strength) to the development of her stable - and she is willing to let me keep my horse in her pasture for free! All told, it sounds like a "Win-Win" situation to me! 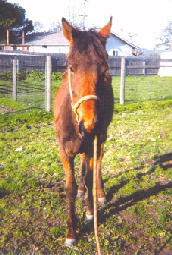 This little filly's condition was so bad that Sadie was afraid that they would have to put her down. However, her vet felt that she was worth saving so for the past year, she's been basically left alone to eat and grow. However, Sadie has five other horses to feed so now she has come to me! My gameplan, for now, is to keep her on pasture with twice a day feedings. Sherry's pasture is very lush and all of her horses are fat and happy, with no additional supplementation. Luna gets a flake of alfalfa, and 1/2 lb. of LMF Super Supplement, with 1/8 cup of corn oil, twice a day. I'm having a vet come out for her initial de-worming and shots. We'll give her a general "once-over," and maybe do some bloodwork as well, if the vet feels it's appropriate. I expect her to put on some more weight, and with any luck, maybe she'll grow in height as the summer progresses. As she fattens up, I will begin her training with extensive groundwork and conditioning. Lots of lunging and learning voice commands. My desire, ultimately, is to start her out with dressage basics, and maybe move on to more dressage, or lean toward hunting/jumping. Or, depending upon how she progresses, I may just have a laid-back hackabout type of horse. Either way, I plan to love her and give her the best care that I can! I hope to record her progress on this webpage (you know, with all that abundant spare time that I have!). And I welcome any comments, feedback or suggestions on what I can do to help her develop. I'm hoping some of my soon-to-be new friends from rec.equestrian will pop in here and share their collective knowledge with me either via email or newsgroup post :) Right now, I am really interested in any recommended reading or websites on Nutrition and growth and development of young, malnourished horses. I'm also interested in suggestions for building her up and developing her muscles (for later this summer). I figure her shoulders, flanks and rump will develop over time with lunging and groundwork, but I am concerned about her neck and chest development. Basically, all comments are welcome! Well, the vet came out and gave her a "look-see." She acknowledges that she is thin, but not terribly unhealthy. Luna was such a sweetheart through the visit, and Dr. Leslie loves her! Her legs and hooves look good, and she should fill out with proper feed and maintenance. 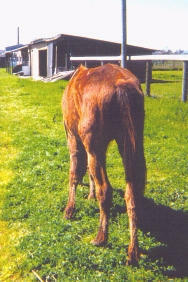 Her manure was examined, and her "output" seemed quite coarse - with whole grains evident - indicative of poor digestion. She also has hypermotility (her tummy growls a lot). A closer inspection of her teeth revealed lots of sharp edges - which explains why she's finicky about her hay, and not putting on enough weight. She also has Wolf Teeth that will need to be extracted. She got dewormed with Ivermectin, and received her 4-in-one shots, and Dr. Leslie will be coming out again in the next week or so to float her teeth and get her final vaccinations. Because her digestion is compromised, and since we want to pile the fat on her, the vet recommended that we switch her to Equine Senior (pelleted, ground-up soft feed, high in fat and protein). We also added Rice Bran (very high in fat), in addition to her LMF and corn oil. She's also had difficulty with her alfalfa (too difficult to chew) so we're trying half alfalfa and half Orchard Grass (1 flake each, per day). I have read that Corn Oil should not be fed with Rice Bran, but I haven't found a scientific explanation for why it shouldn't be done. And the vet really wants us to pour the fat on... So, until I hear otherwise, that's the plan! The good news is - I went up to see her two days after we started the switch to new food and Luna's energy levels have increased dramatically! She no longer ambles around the pasture, dragging her feet. She actually walks with some impulsion. She is attentive and happy - albeit a little lonely since her pasture mates had to be moved out for controlled feeding (they are all about 75 lbs overweight!). I brought her out to groom her and practice trailer loading and she acted like she'd had a triple shot of espresso! Very energetic!!! Some sad news... Terra Luna had been showing so much progress over the last couple of weeks... She was putting on weight - at her last measurement, she had gained over 35 lbs. She was beginning to fill out and actually developed a belly. Unlike her first pictures, when you looked at her from the front, you could actually see her barrel on either side of her. She was beginning to shed out her winter coat, and she looked sleek and beautiful. I couldn't wait to see how she would turn out. I even started teaching her how to lunge. Mostly just walking and trotting, but she was learning her Voice Commands - "Whoa" was the most important, and she learned that quickly! She was feeling energetic and happy. She had even jumped the fence a couple of times to be with Pal, an Arab gelding (who didn't realize he was a gelding! ), whom she had developed a crush on! On Saturday, May 1, I drove up to Santa Rosa in high spirits. It was going to be a rough day since Terra Luna was scheduled to have her teeth floated. But I planned on arriving early enough to spend some "Quality Time" with her (what's a couple more hours of brushing in the whole scheme of things?!). Well, I arrived at 11:30 to find Sherry in a panic and Terra Luna down in the pasture behind the barn. She had already called the vet to come out ASAP. Terra Luna was in a great deal of pain, sweating, trembling, nickering horribly, and convulsing occasionally. She was in a horrible state and kept trying to get up. I knelt by her head and tried to soothe her while Sherry explained the morning's events. Evidently, she had been okay that morning - but she didn't want to get up and eat her breakfast - which wasn't all that unusual since she'd just been moved to a new pasture. However, she had gotten up and wandered around a bit, so Sherry thought that things were okay. But then, at 11:15 she whinnied and all the other horses ran toward her as Sherry saw her go down. She just dropped and fell with her hooves going straight up in the air. That was when Sherry called the vet to come ASAP. My poor baby continued to thrash about. She fought all the way till the end and, at 12:05 she managed to get up one final time, staggered two steps and - quite literally - dropped dead. 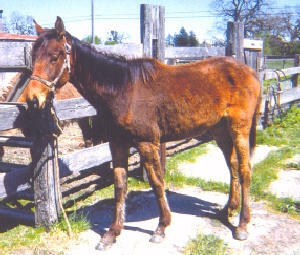 This is a sad reality, and the possibility of this happening to a neglected horse is very real. Even after beginning a worming/maintenance program (Sadie had maintained her worming schedule), the fact of the matter is: The damage had already been done. I am greatly saddened by the loss of her young life. 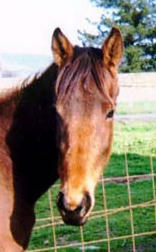 She was such a sweet filly, with so much potential. She had shown so much progress in the short time we were together and, even though she was a Sweetheart, she had an independent streak a mile long! I am trying to cling to the positive aspects of our time together, and remember Terra Luna as a living, recovering filly. I'm glad to have had the opportunity to know her and work with her. I know that her final weeks were happy, that she was surrounded by her friends, Dancer, Amiga, Nike and Amber - and, of course, her "boyfriend" Pal. Sherry loved her and always spent a little "extra" time with her (she loved to have company while she ate her meals). And, as difficult as it is to say "Goodbye," I have to say that my life was improved immensely, just from knowing her. I had considered taking her page down - but then I thought that this information should be shared with others. If nothing more, this underscores the importance of proper care and maintenance of horses - young and old - If this inspires even one person reads to begin a strict worming and maintenance program, then maybe other horses can be saved... And Terra Luna's passing will have some meaning. So please... please... If you own a horse, make sure you understand the importance of proper care! No one should have to endure the agony that Terra Luna experienced at the end. I *do* want to point one thing out: If you are planning on *starting* a worming schedule on a horse that had not been wormed previously, please make sure that you consult a vet first! I was very concerned that if I zapped her with a mega-dose of Horse Wormer, the worms could die en masse, get impacted in her intestines and cause colic. Alternatively, I have since discovered that they can *also* clog up the arteries, if that's where they are when they die. In Terra Luna's case, the vet felt that she really wasn't all *that* wormy - but we decided to start off with a half-dose of Ivermectin for her first treatment, followed by a second half-dose two weeks later. *Always* consult a vet prior to making any significant changes to your horse's health maintenance schedule. When I feel better, I will research the importance of worming and proper horse care, and I hope to post links to sites that pertain to horse rescue, basic horse care and worming... So, if you know of any good links, please drop me an email. Thank you. 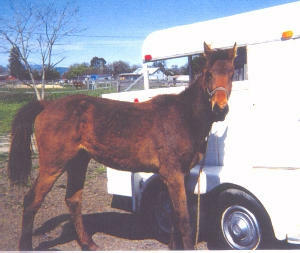 UC Davis Center for Equine Health An article about rehabilitating the starved horse.